For other uses, see Suda (disambiguation) and Souda (disambiguation). The Suda or Souda (/ˈsuːdə/; Medieval Greek: Σοῦδα, translit. 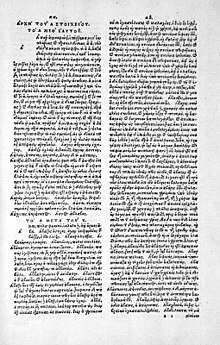 Soûda; Latin: Suidae Lexicon) is a large 10th-century Byzantine encyclopedia of the ancient Mediterranean world, formerly attributed to an author called Soudas (Σούδας) or Souidas (Σουίδας). It is an encyclopedic lexicon, written in Greek, with 30,000 entries, many drawing from ancient sources that have since been lost, and often derived from medieval Christian compilers. The derivation is probably from the Byzantine Greek word souda, meaning "fortress" or "stronghold", with the alternate name, Suidas, stemming from an error made by Eustathius, who mistook the title for the author's name. The Suda is somewhere between a grammatical dictionary and an encyclopedia in the modern sense. It explains the source, derivation, and meaning of words according to the philology of its period, using such earlier authorities as Harpocration and Helladios. It is a rich source of ancient and Byzantine history and life, although not every article is of equal quality, and it is an "uncritical" compilation. Much of the work is probably interpolated, and passages that refer to Michael Psellos (c. 1017-78) are deemed interpolations which were added in later copies. This lexicon contains numerous biographical notices on political, ecclesiastical, and literary figures of the Byzantine Empire to the tenth century, those biographical entries being condensations from the works of Hesychius of Miletus, as the author himself avers. Other sources were the encyclopedia of Constantine VII Porphyrogenitus (912–59) for the figures in ancient history, excerpts of John of Antioch (fifth century) for Roman history, the chronicle of Hamartolus (Georgios Monachos, 9th century) for the Byzantine age. The biographies of Diogenes Laërtius, and the works of Athenaeus and Philostratus. Other principal sources include a lexicon by "Eudemus," perhaps derived from the work On Rhetorical Language by Eudemus of Argos. The lexicon copiously draws from scholia to the classics (Homer, Aristophanes, Thucydides, Sophocles, etc. ), and for later writers, Polybius, Josephus, the Chronicon Paschale, George Syncellus, George Hamartolus, and so on. The Suda quotes or paraphrases these sources at length. Since many of the originals are lost, The Suda serves an invaluable repository of literary history, and this preservation of the "literary history" is more vital than the lexicographical compilation itself, by some estimation. In addition, double letters are treated as single for the purposes of collation (as gemination had ceased to be distinctive). The system is not difficult to learn and remember, but some editors—for example, Immanuel Bekker – rearranged the Suda alphabetically. Little is known about the author, named "Suidas" in its prefatory note. He probably lived in the second half of the 10th century, because the death of emperor John I Tzimiskes and his succession by Basil II and Constantine VIII are mentioned in the entry under "Adam" which is appended with a brief chronology of the world. At any rate, the work must have appeared by before the 12th century, since it is frequently quoted from and alluded to by Eustathius who lived from about 1115 AD to about 1195 or 1196. The work deals with biblical as well as pagan subjects, from which it is inferred that the writer was a Christian. The standard printed edition was compiled by Danish classical scholar Ada Adler in the first half of the twentieth century. A modern translation, the Suda On Line, was completed on 21 July 2014. The Suda has a near-contemporaneous Islamic parallel, the Kitab al-Fehrest of Ibn al-Nadim. Compare also the Latin Speculum Maius, authored in the 13th century by Vincent of Beauvais. Adler, Ada (1928-38) Suidae Lexicon. Reprinted 1967-71, Stuttgart. ^ Gaisford Thomas; Küster, Ludolf, edd., (1834), Suidae Lexicon, 3 vols. ^ Bertrand Hemmerdinger, "Suidas, et non la Souda," Bollettino dei classici, 3rd ser. 19 (1998), pp. 31f., defends the name Suidas (Σουΐδας), arguing that the form Σουΐδα/Σοῦδα is a Doric genitive. ^ a b c d e f g h i j k Chisholm (1911). ^ a b c d Herbermann (1913). ^ Karl Krumbacher concluded the two main biographical sources were "Constantine VII for ancient history, Hamartolus (Georgios Monarchos) for the Byzantine age". ^ Krumbacher, Karl, Geschichte der byzantinischen Litteratur, pp. 268f. ^ "The History of the Suda On Line". stoa.org. Retrieved 10 July 2015. A translation of the last of the Suda’s 31000+ entries was submitted to the database on July 21, 2014 and vetted the next day. Chisholm, Hugh, ed. (1911). "Sūïdas" . Encyclopædia Britannica (11th ed.). Cambridge University Press. Herbermann, Charles, ed. (1913). "Suidas" . Catholic Encyclopedia. New York: Robert Appleton. Dickey, Eleanor. Ancient Greek Scholarship: a guide to finding, reading, and understanding scholia, commentaries, lexica, and grammatical treatises, from their beginnings to the Byzantine period. Oxford, New York: Oxford University Press, 2006. ISBN 9780195312935. Mahoney, Anne. "Tachypaedia Byzantina: The Suda On Line as Collaborative Encyclopedia," Digital Humanities Quarterly 3.1 (2009). Suda On Line. An on-line edition of the Ada Adler edition with ongoing translations and commentary by registered editors.